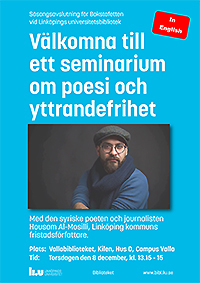 The Linköping University Readers’ Circle ends the year with a meeting with Housam Al-Mosilli, poet and journalist from Syria. Linköping is a member of the international movement “Cities of Refuge” and has welcomed Housam here after he fled Syria in 2012. The meeting of the readers’ circle is open to everyone. Bokstafetten (Linköping University Readers’ Circle) is a forum in which employees at LiU share their reading experiences. This may be something that that has moved or inspired them, either professionally or personally, a reference work or fiction. The Readers’ Circle is now ending the year with a meeting with Housam Al-Mosilli, poet and journalist from Syria, welcomed to Linköping as a “City of Refuge”. He will read some of his own work and describe life as an author in Syria. He may also tell us about how city of refuge Linköping has welcomed him. There will be opportunities for discussion and questions. The general language used during the evening will be English. The meeting of the readers’ circle is open to everyone.